Lakshmi Mittal has become something of a cult figure in the global steel industry. His company Mittal Steel is the largest steel maker in the world. After the recent merger between Mittal Steel and Arcelor which raged a big debate throughout the Europe, Laxmi Mittal current controls 10% of the total steel production and the combined entity that has come into force post-merger is three times the size of its nearest competitors. Lakshmi Niwas Mittal was born on June 15, 1950 at Sadulpur, in Churu district of Rajasthan, in a poor family. The extended family of 20 lived on bare concrete floors, slept on rope beds and cooked on an open fire in the brickyard in a house built by his grandfather. Laxmi Mittal belongs to Marwari Aggarwal caste and his grandfather worked for the Tarachand Ghanshyam Das firm, one of the leading Marwari industrial firms of pre-independence India. The family later on moved to Kolkata where his father Mohan Mittal became a partner in a steel company. 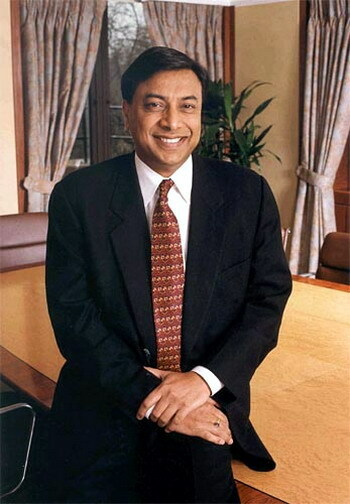 Lakshmi Mittal graduated from St. Xaviers in Kolkata with a commerce degree in 1969. He began his career working in the family’s steelmaking business in India and in 1976, Lakshmi Mittal founded Mittal Steel Company. He split from his father and two younger brothers in 1994 and took the international arm, with interests in Indonesia and Trinidad and Tobago, while the rest of the family kept the domestic Indian business. In the last few years Mittal Steel has made a number of acquisitions, buying up a network of steel producers in former communist countries including Kazakhstan, Romania and Ukraine, and pushing into the U.S. in 2004 with the $4.5 billion purchase of International Steel Group. Today, Mittal Steel is the only truly global steel producer in the world with operations on 14 countries, spanning 4 continents. Lakshmi Mittal is also known for his opulence. In 2003, he acquired the Kensington mansion, said to be the world’s most expensive home, from Formula One racing’s Bernie Ecclestone for £70 million ($128 million). His daughter Vanisha’s $50 million wedding bash is touted as the most expensive wedding of the 20th century. In March 2006, Lakshmi Mittal was listed as the third wealthiest person in the world after Bill Gates and Warren Buffet by Forbes Magazine. Checkout the ASCII Art of Laxmi Mittal in the below link. Please use Lucida Console font to view the art in Notepad. Before that in Notepad go to Format and Uncheck the Word Warp and then Go to Font and Reduce the Font Size to 3 to 4 pt. Use only Lucida Console Font.